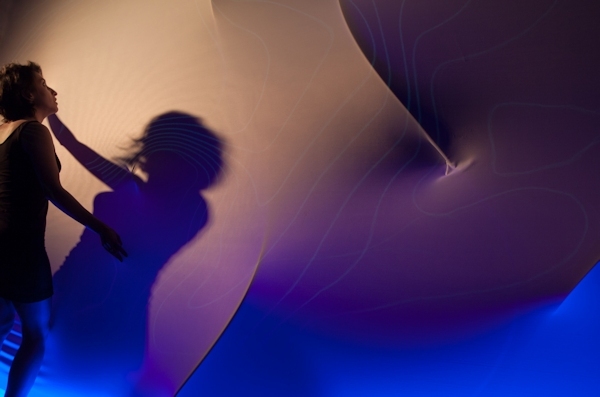 By covering walls in Spandex and using a motion sensing game controller, a designer has created a magical place that is an extension of the human mind and body. We’re used to using gestures like swiping and tapping to control smartphone apps. But could we use the same movements to change the physical world around us? In a project called Breathing Wall, University of Southern California student Behnaz Farahi experiments with what it might look like if walls in a room changed shape whenever we moved our hands. In her experiment, Farahi set up a small room with Spandex-covered walls and hooked up a motion-sensing game controller. Every time a visitor swiped or tapped or made a circle with the controller, the walls shifted in response. But someday soon, the designer thinks that we could start to have a relationship with the buildings around us, training structures to communicate with humans. And eventually we may be able to make rooms transform without a controller in hand.